Coney island babies, originally uploaded by Venus In Furs. Thanksgiving was good, we spent it out on Long Island with my family at my brother's house. We hope that your holiday was spent among loved ones eating until you were uncomfortably full. I'm happy to report that we spent black Friday not shopping. 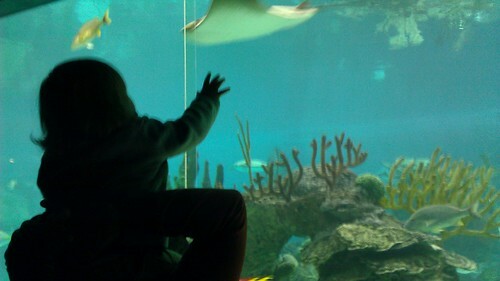 And today we took advantage of this unseasonably warm afternoon by going to the Aquarium at Coney Island. Gibson loved it. He was very excited to see all of the big fish. It's amazing to watch him experience new things. I always feel like the luckiest person when I get to see him giggle and smile. hooray! aquarium! isn't it nice to have a real autumn?